It's coming up to 4am here and I'm feeling bored! I finished my EC round early and now there's really not much left to do. So what does one do when one gets bored? Well there's plenty of things you can enjoy both online and offline. For starters how about starting your own blog? It's simple and there are plenty of free blog platforms you can start with like Blogspot. When you have a blog, you have an outlet to express your thoughts, no matter how silly or trivial. You will also get the opportunity to make new friends along the way. Blogging is healthy and it's a great way to spend time online so that's my first recommendation. 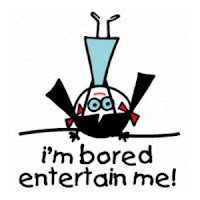 Here are several more get-rid-of-boredom tips for you and remember, whatever you decide to curb your boredom, just have fun! * Immerse yourself in online games. There are so many online games you can try playing. It's fun it's easy to access and you'll definitely forget about your boredom. * Discover interesting videos online especially on YouTube. That's what B has been doing lately; checking out sitcom bloopers online and some of them are hilarious! * Get involved in active social networks and make new friends that share your same interest. Interacting with my Facebook friends can be so relaxing and fun and don't forget there are plenty of games there as well. If none of the above tickles your fancy, you can always have some fun with free chat or free teen chat at Talk121. A free local phone chat line service offering live chat and also voice personals, Talk121 presents you with a great place to chat away your boredom. Chatting makes for a great boredom-reliever and for a limited time only, Talk121 is offering Free Access to their chat line. This basically means you can pick up your phone right now to chat the night away! So there you have it! A few good tips to kill some time when you're feeling restless and bored. And if all else fails, you can always fall back on good old sleep to keep the monotony at bay! bored GP??? hehehe.. I got no time to be bored ni.. still got post to write and my client just came back from holidays with tons for me to do..heheh..
you finished playing your burger shop? LOL! This is what I get for finishing ec early Mon, nothing to do he he! Hehehhe I wen shopping edi just now Mon, done with ec, bought ads edi, burger shop almost finished…what else?? Hahha! You got some PBs to do right? You started dropping edi or not??? Thanks Mon, got plenty of credits in my acct but love receiving free credits as well yay! u def got plenty of credits coz u drop 900 everyday woo-hoo! oh ya dat time no connection right? aiyooooo i refreshed non-stop edi hahahhahahahahahh!!!! Dunno which PB to do first now…one at meows or here…hmmm…. After reading this, I don't feel bored at all - thanks for all the great tips! Is it the debt mgt one at LW???? Yes yes long time edi the kids got no new clothes, poor things lol! which one? u mean the debt mgnt? eh but the price dropped edi lah! Yeah debt mgt… dunno wan to chop or not..
My RM one oso still there… faster la gimme me new one lol! He he definitely! Must go shopping at pet safari soon..
hahahaha and my LW one oso still there!! LOL! yeah the price dropped edi! coz i got more than 5 after 30%..
Don wan la to chop then muahahhahahaha! And now I like SR too and I hope they give me more PBs…how abt BV? U no like? Eh sometimes like dat… I oso did few jobs for them then next month see same opp but at lower price! Really??? None at all?? U just joined BV? username and PW for BV!! Ohhhhhhh can u write in to them to retrieve ur PW?? LOL I understand… I oso got many passwords, sometimes forget too. Try writing in sweetie, they shld be able to help. Maybe can give ur blog url as well. later u go read Mariuca! You too what eh dearie? Lost track edi! Hehe.. I dl already.. but tak sempat main.. maybe tunngu I balik SG kot..
Haha.. refreshing the page but no new post lah.. lol! Oh u mean Boldie? Tu la….. depresi ni thinking abt it, I had to read the daily recap online…some more one epi one short paragraph, mana cukup?? :( since April okay me!! Okay, sure u oso will be hooked nanti, making burgers and pizzas! Hahahah sorry ladies, I went to make coffee dat time and then fed the kids he he hee, but lucky still got the chop so yay! Eh I use to see this site that had the whole day recap.. not just one para..
nanti I carik and give to you..
Yeah.. I also just fed the kids Shemah! Ok, sure enjoy! Hard to stop nanti lolz..
Tikus and Mau together- forever ROTFLMAO! Heheheh yeah lor… after all Tikus and Mau mmg go hand in hand right? LOL! so cute lah Tikus and Mau go hand in hand! Go to sleep! Maybe not so boring in dreamland! haha! Wow! So many people commented already! Hmm....I won't get bored I thing...because there are too many things waiting for me to complete. Today I have lotsa things to do Ayie so no more boredom lol! I dunno how to pay DOTA Tekkaus, ,happening ke?? Tikus and Mau foreva! ROTFLMAO! U and ur adorable panda avatar Foong!